Buenos Aires is the capital, as well as the largest city in Argentina. The southern shore of the capital is located on the Rio de la Plata, precisely located along the south eastern coast of South America. Due to conflicts after the 19th century, Buenos Aires was federalized and therefore removed from the Buenos Aires province in 1880. Originally the name “Buenos Aires” came from the sanctuary of “Nostra Signora di Bonaria” which is Italian for “Our Lady of Good Air,” or also “Virgine de Bonaria” in Spanish. The sanctuary which the city is named after is found in Cagliari, Sardinia. Due to the separation from the Buenos Aires province, Argentines often refer to Buenos Aires (the city) as Capital Federal to make the distinction clear as to the city and the province. In the constitution of Argentina, the city is referred to as la Ciudad Autonoma de Buenos Aires. The city was discovered when Juan Dias de Sois from Portugal was navigating in the name of Spain. He was the first European to have reached Rio de la Plata in 1516. His expedition was cut short when he was killed by the native Charrua tribe where Uruguay now stands today. The city was first established as Ciudad de Nuestra Señora Santa Maria del Buen Ayre (City of Our Lady Saint Mary of the Fair Winds). Due to attacks by indigenous peoples, settlers were forced away and in 1541 the site was completely abandoned. The second settlement, which was also a permanent one, was established in 1580 by Juan de Garay. Because of the city’s location along the waterfront, its success depended on trade. Spain was aware of the great amount of prosperity that could be achieved and therefore insisted on all trade to Europe to pass through Lima, Peru during the 17th and 18th centuries so that taxes could be collected. This scheme further frustrated local traders of Buenos Aires, then creating a contraband industry. Deep resentment in porteños was held towards the Spanish authorities because of this. Later Carlos III of Spain eased trade restrictions and declared Buenos Aires to be an open port in the late 1700s. From 1806-1807 British invasions of Rio de la Plata occurred twice but were managed to be held back by local militias. On May 25, 1810 while Spain endured the Peninsular War—criollo citizens of Buenos Aires successfully ousted Spanish Viceroy and made a provincial government. May 25th is now the national holiday where formal independence was declared in 1816. Today Buenos Aires is Argentina’s main center for liberal and free trade ideas, whereas many provinces in the northwest are more conservative-Catholic. Due to these contrasting views, centralist-federalist conflicts of the 19th century have resulted throughout the provinces. Resulting violent clashes have also come about due to this. During the 19th century, the city suffered from naval blockades on two various occasions from the years 1830 to 1840 from the French, as well as a joint Anglo-French blockade beginning in 1845. Both of such blockades failed to surrender the city and foreign powers eventually desisted from their demands. Throughout the 19th century, the political status of Buenos Aires remained a sensitive subject. This was in part due to the succession of Buenos Aires from the Province of Buenos Aires between 1853 and 1860, this issue not being settled until 1880 when the city was federalized and finally became the seat of government, with its mayor appointed to position of president. The Casa Rosada became the official seat of the office of the president. Along with the 19th century came the beginning of the railroad construction throughout the country, mainly in the second half of the century. This construction came along with the increased economic powers of Buenos Aires due to the immense flow of raw materials into its factories. Because of this, the city became a multi-cultural city that ranked with other major European capitals. A main figure of this time period of Buenos Aires is the Colon Theater, which soon became one of the world’s top venues within the city’s main avenues built during the late 19th century and early 20th century. Along with the great architecture of the theater, some of the first tallest buildings of South America were built throughout Buenos Aires, as well as the first subway network. Due to its extensive cultural characteristics and architectural feats for the time, the city was a favored destination for immigrants from Europe throughout the 1920s. Because of the great influx of immigrants, numerous shanty towns started to grow around the industrial areas of the city, leading to an increase of social problems and poverty which was a great contrast to the country’s predominant riches. Later in the 20th century, fighting between the left-wing revolutionary movements and right-wing paramilitary group Tiple A, supported by Isabel Peron (President Juan Peron´s wife) who later became president after her husband’s death, increased. The military coup of 1976 escalated the liberal versus conservative conflict, inevitably leading to the “Dirty War.” By the end of the Dirty War, 10,000 to 30,000 people were missing, kidnapped, and killed by the military. In protest to the war and its happenings, silent marches from mothers lost known as the Mothers of the Plaza de Mayo become known for the image of the people suffering throughout the country at the time. 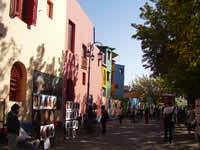 Buenos Aires was divided into 48 original barrios—neighborhoods for administrative purposes. Originally, the divisions were based on Catholic parishes, however since changes during the 1940s, a series of changes have drastically rearranged the city’s structure. Today the city is divided into 15 communes. As of 2001, 12.4 million people were living as residents in city and residential zones of Buenos Aires. The population density of the city is 13,000 hab/km squared making Buenos Aires the most populated city in Argentina. 88.9% of the population is white (European), 2% is African American, 7% is Native American, and 2.1% being Asian. The city is strongly influenced by European culture and because of this, is often called the “Paris of South America.” As mentioned before, it is home of the Teatro Colon, one of the world’s greatest opera houses. It holds several symphony orchestras and choral societies. In addition, throughout the city, museums of fine arts, modern arts, decorative arts, popular arts, sacred arts, theatre and popular music, as well as well-preserved homes of famous writers and artists can be found. Libraries are also in abundance throughout Buenos Aires, where botanical gardens and well-landscaped parks can be found in contrast. Buenos Aires is also the home to a world famous zoo and botanical garden. 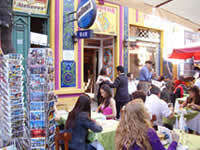 The language found predominately in Buenos Aires is known as Rioplatenese Spanish. Its distinct sound is characterized by voseo, yeismo, and the loss of the syllable final-s. The dialects of Andalusia and Murcia have heavily influenced the evolution of the Spanish found in Buenos Aires. After a study was conducted in regards to the dialect, the results showed that the porteño accent is the closest to the Neapolitan dialect of Italian than any other language today. By the early 20th century, Argentina absorbed millions of immigrants from Europe—mainly Italians—who spoke mostly their local dialects (mainly Neapolitan, Sicilian, and Genoan). The adoption of Spanish for such immigrants was gradual, creating a wide array of Italian dialects and Spanish known as Cocoliche. Its usage today is mainly obsolete where its presence still lingers due to comic relief. Many Spanish immigrants from the region of Galicia came to Buenos Aires as well, where their Galician language, culture, and cuisine had a major presence and effect in the city for most of the 20th century. Yiddish is also commonly heard throughout Buenos Aires , especially in the Balvanera garment district and in Villa Crespo up until the 1960s. Korean and Chinese became significant languages beginning in the 1970s due to the amount of immigrants from Asia, however newer immigrants are quicker to learn Spanish in order to begin the assimilation process.